1. Place the berries in a saucepan with the sugar and liqueur. Cover then warm over a low heat for 8-10 minutes, or until the sugar has dissolved and the fruit is soft but just holding its shape. 2. Remove from the heat and leave to cool slightly then drizzle over a little more liqueur to taste. Serve warm or leave to cool and chill until needed (or for up to 24 hours). 3. Mix the mascarpone ingredients together until smooth. 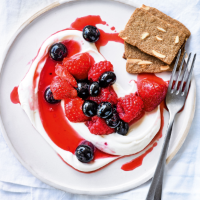 Serve with the berries. Delicious with almond biscuits.